Anywhere pleasantly dim, refreshingly moist, and full of beautiful examples of nature's most poisonous creativity. A picture from the contents of an Optimystic's bag... it seems to be a self portrait. The Optimystic is a happy go lucky dungeon boss-monster. The Optimystic is a boss monster from the land of children's dreams; it prefers to call itself a 'hero-self-help assistant', believing that heroes should look to death as a cure for their drunkenness rather than the local tavern. Of short stature, green skin, donned in a radiant brown and rocking a staff of good cheer, they mystify and confound any sober hero with their resemblance to something far far away from recollection. A strong believer in the brighter things in life, the Optimystic is a loving gardner of poisonous mushrooms, and enjoys helping out the vilest of natures, adamantly seeing only the good in things. It sees a perfect being in all. Optimistically, it warmly calculates with a philosophy of the denial of all things bad. Although a self proclaimed 'mystic of self-help', the Optimystic is much more well versed in curses, necromancy, and hexes than anything related to helping. 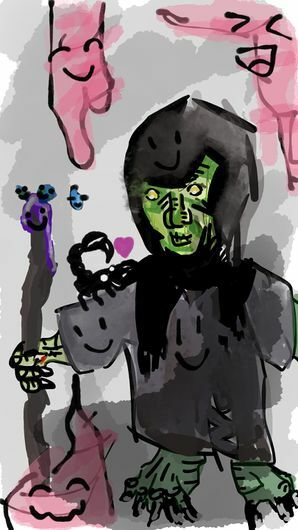 The necromancy is a result of every Optimystic's loathing of his own peers; and thus its need for more knowing friends, the curses and hexes were in no small part due to the hopeful words of instant, ultimate power contained in every dark arts book; the Optimystic failing to note the danger, only the advantages. Miraculously, their unclouded vision gave them quite an advantage in the horrors of the dark, and every Optimystic is a terrifying, grotesque, caricature of pure, unblemished, hope and care.